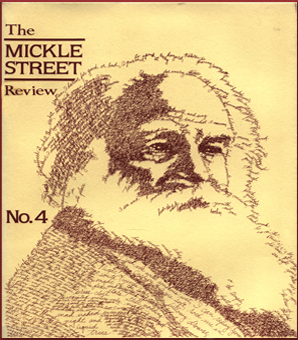 Each year, beginning with this issue, the Mickle Street Review offers a prize of $100 to the contribution that we feel best represents the continuing influences of Walt Whitman on American writing. This year’s award goes to Eric Nelson for his sequence of poems, The Light Bringers, which explores the birth, life, death, and legacy of an American worker in the era and region in which Whitman lived. We wish to thank Mrs. Doris Kellogg Neale for making this award possible, and all of our other contributors for providing us with excellent literary works that demonstrate the ways in which Walt Whitman’s legacy continues to work. Are due the following writers and presses for permission to reprint previously printed and copyrighted works: Antler, Section III from Factory (City Lights Books, 1980); Elizabeth Searle Lamb, “At Cranberry and Fulton Streets” (Flatbush Magazine, 1965); Howard Nelson, “Reading ‘Crossing Brooklyn Ferry’ On a Summer Morning” (Missouri Review).